Disclosure: I was provided promotional material and a screener in exchange for my honest review. All views shared are mine and mine alone. Have you seen a movie that you just can't get out of you head, or makes you think about your life and its purpose? 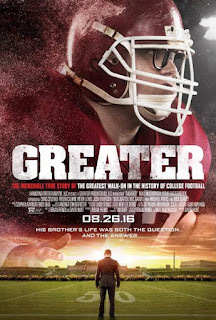 Since watching GREATER the other day, I can't stop thinking about this movie, which is based on the main character, Brandon Burlsworth's life. While I am not a huge football fan -- outside the Superbowl (mainly for the commercials and half-time time, but shhh don't tell), I loved this movie and powerful messages is shared. If you cry at movies, you will definitely want to have a box handy as you will need them. Looks and sounds like a great family-friendly movie, right? Well, it really is, and is one that will have you talking days later with family and friends about. What moved me so much about this movie is the dedication and perseverance Brandon had in seeing his dreams become reality. While he struggled and at times questioned things, he never gave up, which I have to say it awe inspiring. I wish this movie could have a happy ending, where Brandon went on to win Superbowl rings and lead his NFL team to victory, but that is not the case. Unfortunately, Brandon passed away in a car accident on the way back to his hometown, shortly after being drafted by the Colts. How could something like this happen, especially to a kind and gentle soul like Brandon? You are not alone in wondering this. And, when you sit down to watch the movie, you will find his family, friends and teammates wondering the same time. Why would God take Brandon? Was he really needed up in Heaven? He needed more time to achieve greatness on Earth. The questions could go on and on, and as you watch the film you may find yourself questioning your faith and why you or someone you know may have been taken too soon or have to deal with a hardship or medical condition. Why? 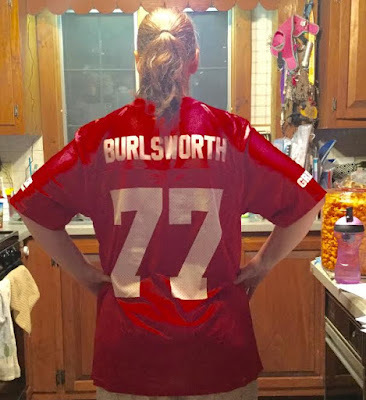 We could continue to ask why, but instead, this movie was made to introduce us to Brandon Burlsworth and see that even an underdog and achieve his dreams, if he only believes in himself and never gives up. Brandon was determined and faced adversity head on, and truly inspired not only those who crossed paths with him, but those who continue to follow in the footsteps of Brandon by dreaming big and going for it. This movie will have you laughing and crying and cheering Brandon on, as his memorable life is shared in such a moving and powerful way. The cast of actors, while many are not known, do an amazing job in portraying Brandon, his family and those in his football family. You don't have to like or even know about football to enjoy this movie, and find yourself being moved by it. I could go on and on about how wonderful this movie is. But, instead, why not check it out this weekend with your family and see for yourself. This is one movie you will remember and find yourself talking about. It will make you take a step back and look at your life and remind you that you are never too old to dream or set goals. You just have to be willing to put in the work and dedication to see these dreams and goals come to fruition. And, before I end this post I wanted to share a GoFundMe page set up for Chris Severio and his family. 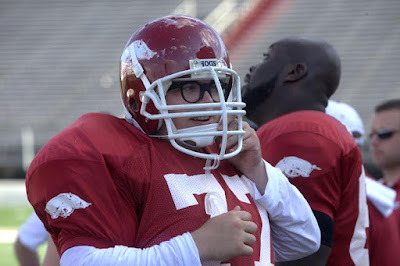 Chris played the lead actor role of Brandon Burlsworth, and did an amazing job. Unfortunately Chris and family experienced a major loss as a result of the recent Louisiana floods. Chris and his family lost everything in the floods. The GoFundMe page was set up to help Chris and his family rebuild. If you feel inclined to donate, you will help Chris and his family start to pick up the pieces and rebuild their lives. Donate here: https://www.gofundme.com/28422ctg. Want a chance to win 2 (size large) #77 jerseys? Then, complete the entries on the Rafflecopter form below. Good luck! I would share it with my son Carlos... But I think my daughter would want it also! I will share my extra jersey with dad. I will share the other one with my mom!